Celebrate the glorious spring Easter festivities by decorating your home with the help of this amazing machine embroidery design! It features a basket full of Easter eggs. 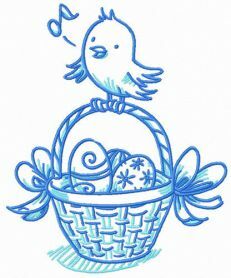 The basket is decorated with ribbons and the eggs are covered with fanciful ornaments. A tiny birdie has landed for a rest on top of the basket handle. This needlework comes in the shades of turquoise and dolphin blue so it’s really easy to customize it with any colors to your liking. 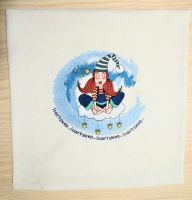 You can stitch out this embroidery design to napkins, tablecloths, aprons, cushions, gift boxes, towels, blankets, sweaters and much more. 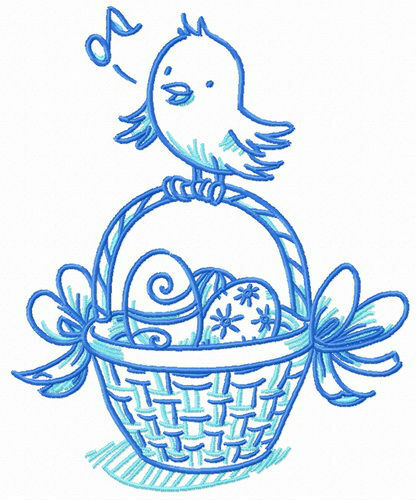 Pretty birdie design for my Easter napkins) I've decided to renew my kitchen accessories this year. Thanks for wonderful patterns. Looking forward to working with my new Brother 760 machine. Great price! 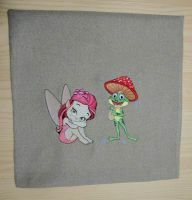 Fast download and fast stitching. 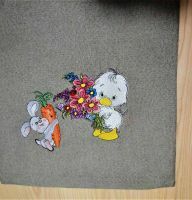 Nice simple design, it's easy to embroider the Easter bird pattern even for the beginners. Would exactly purchase in the store again.